Why is a Gutter Protection System Important? Foundation work can be expensive. As a homeowner in Wisconsin, you’re likely familiar with our extreme weather patterns, which means you’re probably aware that structural damage — especially to older homes — is common. Foundation damage is a regular issue here in the Midwest, but the best preventative measure is as simple as installing a gutter protection system. Weather Tight offers gutter protection systems to customers who have Weather Tight gutters installed on their homes. You can prevent foundation damage by investing in simple, cost-effective, preventative measures. One of the easiest (and most affordable) ways to prevent damage to your foundation is by keeping your gutters flowing and moving running water away from your home. Winter is inevitable. Water, rain, leaves, and dirt can’t be avoided. That’s why a solid gutter protection system is vital to protecting your home (and for added safety – it keeps you off the ladder, cleaning out gutters). The primary need for a gutter system is to ensure that water properly drains away from the foundation of a building. Gutters work well when they are maintained, properly pitched, and perhaps, most importantly, kept clear of debris. Without proper gutter drainage, water will back up in the gutter and overflow. This excess water creates major structural problems by weakening and eventually destroying the concrete foundation of your home. If your current gutter system is correctly installed and pitched so that water runoff flows effectively, we’d bet that clearing gutter-clogging build up is responsible for at least one annual headache. 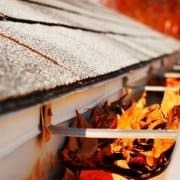 Debris, leaves, and dirt collect in your gutters and the inevitable removal process is both time consuming and dangerous. Anyone who’s spent hours on a ladder knows the hazards all too well. Unfortunately, if you ignore clean up, your gutters simply won’t function properly. Gutter cleanup isn’t a one-time fix, either. This is a dirty job many homeowners must undertake multiple times per year. In the spring, you perch perilously on a ladder as you clear the gutters of winter debris in anticipation of April showers. In the summer, your backed-up gutters become a breeding ground for mosquitos due to the standing water pooling in the system. In the fall, you’re facing falling leaves and sticks that must be cleared to prepare for winter precipitation. Clogged gutters in the snowy months lead to excessive water runoff, damage to your roof, icy buildup on sidewalks, and many more hazards. Worst case scenario, improper drainage leads to structural damage. Without clear gutters, it’s only a matter of time before water damages your house. Save yourself the hazards and the dangerous trips up and down the ladder. Install a proper gutter protection system and you’ll also save money from pesky foundation repairs in the future. What Are Gutter Protection Systems? There are a lot of gutter protection options available on the market today, but it’s important to understand, not all gutter protection methods are created equal. Here’s how the different systems measure up (including our recommendation, below). Support the weight of ice and snow in the wintertime. Wisconsin winters are particularly harsh, so this is especially important. You don’t want gutters caving-in or breaking due to the weight of ice. Prevent large debris from clogging the flow of water by protecting the top of the gutter. Trees create a lot of falling sticks and leaves that easily collect in your gutters. As the debris builds up, it mildews, molds, and creates an unpleasant sludge–this is often what people think of removing when they’re tasked with cleaning gutters. Yuck! Allow small debris (broken twigs, seeds, etc.) to wash away with water flow and avoid clogs. Small pieces of debris easily build up to create water flow barriers, especially if there are larger sticks and leaves already stuck in the gutters. This results in gutter overflow and water damage to your home. One of the most common solutions, this gutter protection system clips onto your gutter and gets its name from the screen mesh dome running along the top of your gutter when installed. Available at many local stores and hardware centers, the main issue with this style of gutter protection system is that the holes in the wire mesh easily become clogged. Because the mesh design captures debris so easily, it builds up over time and blocks the holes. Once these holes are blocked, the gutter protection system no longer works. As a result, you still end up on a ladder, cleaning debris from mesh wire instead of from the gutter itself. Another mesh weave gutter protection system, the vinyl material is easy to install and lays flat over the gutter. This gutter protection system creates the same problem as the aluminum dome system: the small mesh holes are easily clogged with twigs, leaves, and branches. In addition, these vinyl material inserts don’t stand up well to the bitter cold, wet, and icy Wisconsin winters. They don’t support the weight of ice and snow, and in a few seasons, the vinyl becomes brittle and breaks due to exposure. Once again, you’re on the ladder every year cleaning gutter clogs out of holes — this time in vinyl. This is a much better option than the dome or vinyl systems, but the bullnose design is still flawed. 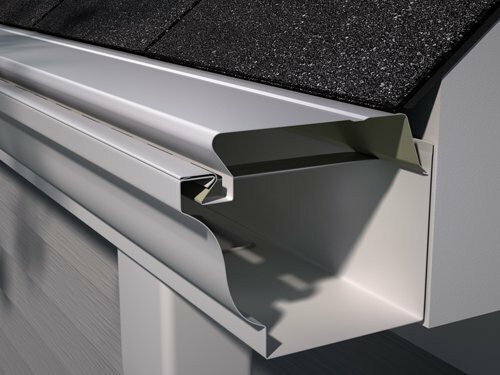 The bullnose shape allows water to flow into the gutter while enabling large debris to fall right over the gutter to the ground below. Nearly every bullnose solution is built with a slotted design. These slots are part of the system support structure, and while able to stand up well to the elements during any season, the slots still become clogged. The smaller the slot, the faster they get clogged. Like the other solutions mentioned above, rubble, leaves, and sticks build up, block water, and force you to climb back up on the ladder. The Weather Tight Advantage — Efficiently Clean Gutters! Weather Tight is proud to offer the patented E-Z HydroClean Gutter Protection System to customers who have Weather Tight gutters installed on their home. Our custom bracket system improves upon the classic bullnose design by eliminating the slot entirely. Weather Tight’s bracket design hooks onto the gutter wall, creating wide gaps for water to flow while providing strong support for the system. Like the bullnose gutter protection system design, water drains over the top of our system and into the gutter, while large debris falls to the ground below. Because there are no slots in the Weather Tight system, small bits of refuse wash into the gutter and are pushed out with the water flow. This gutter protection system keeps water flowing efficiently inside gutters and away from the foundation of your home. Installing our Weather Tight gutter protection system is fast and easy too! Our installation specialist first loosens the shingles along the edge of your roof and installs the brackets for the gutter protection system. Then, by sliding the gutter protection panels underneath the loosened shingles, the specialist connects the panels to fit tightly to the new brackets. Next, the panels of the gutter protection system are screwed down to the roof beneath the shingles. Finally, the panels are screwed down where they overlap with specialized screws — and that’s it! 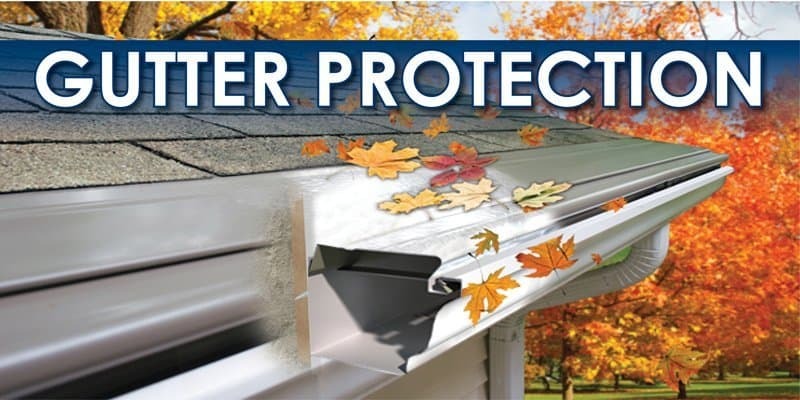 Your new gutter protection system is ready to keep your home safe for years to come. Learn more by watching our review and install demo on YouTube, here. Compatible with most common gutter sizes (5” or 6”). Available in 13 color combinations to compliment virtually any roof. Protects your foundation from structural damage. Saves you money on expensive future repair work. Prevents the need to clean your gutters (and keeps you off the ladder)! Can only be installed with Weather Tight gutters. The Weather Tight E-Z HydroClean Gutter Protection System is an elegant solution to gutter protection, preventing gutter blockages while directing water away from your foundation. It’s sturdy enough to stand up to anything Mother Nature throws at it — especially our hard Wisconsin winters. Here at Weather Tight, we understand the importance of protecting your home. We’ve installed countless gutter systems for over 30 years, and we stand behind our work. Give us a call or chat here with one of our reps for a free in-home estimate today! https://www.weathertightcorp.com/wp-content/uploads/2017/12/weathertight-logo-30-anniversary.jpg 0 0 KatiePBG https://www.weathertightcorp.com/wp-content/uploads/2017/12/weathertight-logo-30-anniversary.jpg KatiePBG2018-10-09 16:22:312018-12-07 15:36:49Why is a Gutter Protection System Important? Autumn Prepardness- Gutter tips for keeping fall yard maintenance, a breeze. Weather Tight $25k Home Makeover Sweepstakes- A Winner Every Month! 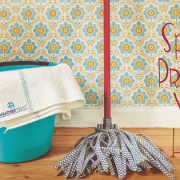 Spring Prepping your Home? Here is a Helpful List to Get you Started! Additional appointment times available upon request.